2018: Howard formed a partnership with Kelly Reeves, playing seven AVP events together with a best of third. Howard ended the year ranked 10th in both blocks (1.02 per set) and hitting percentage (.441). 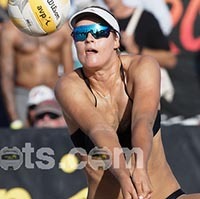 Howard made her FIVB debut in Huntington Beach with Reeves, and the duo finished ninth after upsetting three teams while losing only to teams seeded fifth and first. 2017: Howard began her pro beach career alongside Corinne Quiggle. The duo lost in the qualifier in their first three events, including a pair of three-set losses. In Hermosa Beach the duo advanced from the qualifier and won three elimination matches to finish seventh. The pair played in one other tournament, finishing 13th, before Howard played once with Nicolette Martin, finishing 17th. If she would have played enough to qualify Howard would have ranked fifth in blocks (1.07 per set). College: Howard became the 10th player in Stanford history to collect 1,000 kills and digs. She was named to the Final Four All-Tournament Team her junior season and an AVCA All-America Third Team member as a senior. Howard used her last year of eligibility to play beach volleyball at Pepperdine. She was a Volleyball Magazine All-American Second Team member, posting a 28-3 record at the Number 2 spot with Corinne Quiggle, as Pepperdine finished as the NCAA Championship runner-up. Personal: Howard comes from an athletic family, as her father Steve played basketball at both Saint Mary's and the University of the Pacific and her mother Eileen played volleyball at the University of the Pacific. Her mother competed for two years with the U.S. Women's National Team, winning a bronze medal at the 1986 Goodwill Games, and played professionally for the San Jose Goldiggers. Howard has an older brother, Brad, who played volleyball at Princeton, and a younger sister, Chloe. Howard was a three-time USAV Junior National Qualifier Champion, a 2012 Volleyball Magazine Fab 50 selection, and a 2011 ESPN High School All-American.